Storm warnings. Take steps now to recession-proof your finances. I’m not for fear mongering – it’s not in my nature as a credit counselling professional steeped in positive thinking. Still, there’s no denying that news this week from Canada’s Parliamentary Budget Officer (PBO) is deeply unsettling. I see that household debt in our country keeps breaking records as it rockets towards the stratosphere. If it continues unabated, I fear much grief could come to a lot of families and individuals. Canadian households now owe $171 for every $100 of disposable income. To be clear about the current debt-to-income ratio PBO cites: Canadian households now owe $171 for every $100 of disposable income. To put the numbers into perspective, America’s debt-to-income ratio was about $165 to $100 at the time of the 2008 crash. Collectively, household debt in Canada now amounts to a total of about $1.9 trillion, according to the PBO. 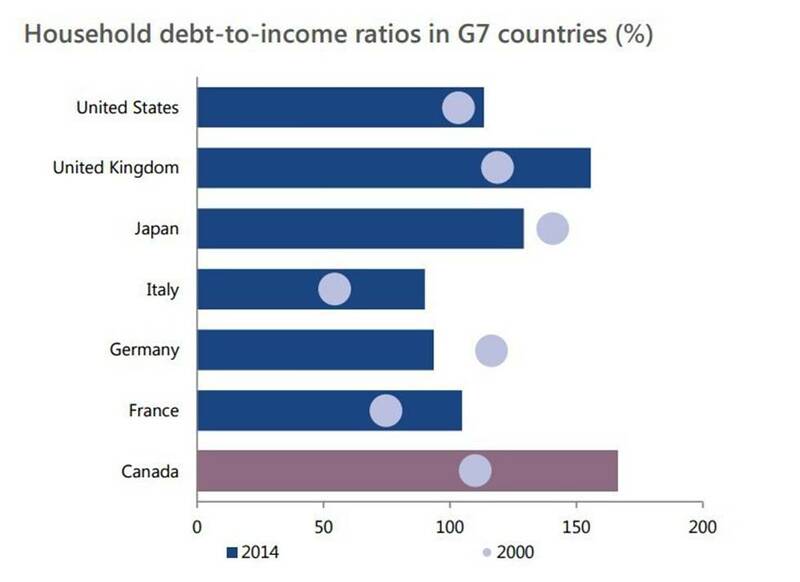 Among G7 countries, Canada leads the pack for having experienced the largest run-up in household debt since 2000. Under the circumstances, I’d say PBO’s warning about our vulnerability to “negative shocks” needs close attention. Several factors are at work. As the Toronto Star reported, our country has officially been in recession since autumn 2015. Jobs are evaporating (especially in Alberta thanks to plummeting oil prices) or they are under threat of doing so in an economy that continues to weaken. Then there’s the specter of rising interest rates. Analysts say that even a small hike in rates could bring debt trouble to the millions of Canadians who, as recent studies show, have overextended themselves financially and are living paycheque to paycheque. We’re not yet facing a perfect economic storm. But warning signals are flashing. Of course, mortgage debt figures into the picture in a big way. The availability in Canada of so much cheap money (aka low-interest credit and loans) for so many years has made jumbo mortgages all too alluring among those who ought to have been more restrained in their choice of housing. Further concerns surround a growing national housing bubble that pundits say could pop at any moment, bringing about a tumultuous drop in the value of residential real estate. Are factors combining to form a perfect economic storm in 2016? I wouldn’t go so far as to say that. Still, warning signals are flashing, and I think Canadians had better soon start taking a hard look at this culture of debt we’ve created for ourselves. The big question: what are we doing to recession-proof our personal finances? The big question of the moment is this: what are we doing as individuals and families to recession-proof our personal finances? I fear too many of us are digging holes we won’t be able to climb out if unwelcome developments unfold. Many are already in trouble and trying to climb out, which is where my agency Credit Canada lends a hand through not-for-profit credit counselling services (best to avoid such steps to begin with though). Right now, I urge all Canadians to keep in mind the old saying, hope for the best, but prepare for the worst. Doing so doesn’t make you a pessimist; it makes you a realist. Take time to take stock of your personal finances and lifestyle not only in relation to the here and now, but also in relation to what the future might bring. Think through scenarios and crunch numbers so that you have a pretty good idea of where you’ll stand if a storm – perfect or otherwise – should hit. If the outlook is unfavourable, you’d be wise to start making adjustments right now to the way you spend, and the way you live.